What I have done is scratch build the front and rear wings out of aluminum sheet. These are done to replace plastic chrome plated wings. In real life they were polished aluminum. I guess I have to mention that this method shouldn't be used for wings that are painted. There is NO point in making the wings out of metal when you are going to paint them. This method isn't as hard as it sounds and the finished product is remarkable. 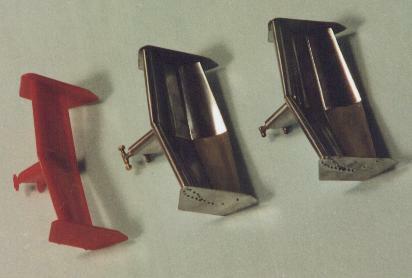 For the Tamiya 1:20 Ferrari 312T3 the front and rear wings are chrome plated. The aluminum material I used was from a hardware store for car body repairs and is about 0.020" thick. You can also get this stuff from you hobby shop but it will be a lot more expensive. I will go through the steps for building the rear wing of the Ferrari 312T3. The same methods will have to be slightly modified for the front wing and different cars. The next section deals with adding rivet detail that may be on the endplates. There are two different methods of adding the detail to your new wing endplate. One method places photo etched or plastic bolt head on the surface of the replacement endplate. The second method used brass rod. (L)With the same drill bit you can make slight impressions in the aluminum endplate. These impressions can be used as a guide to glue your replacement rivets. If you are doing the brass rod method you can drill straight through the aluminum sheet. (R)Here is the finished wing if you have glued replacement rivets to your wing. If you are doing the brass rod method, here is your wing with all the holes in it. For the brass rod method you now take your rod and cut off a length of approx. 2mm (0.08"). File the rod until the tip is square. Cut off a 2mm length again. Repeat until you have enough to fill all the holes on your endplate. Here is an edge view of the wing. In the top picture we have places all the brass cut rods into the holes. Line up all the tips with the flat end to one side. When you are relatively happy that they are lines up you can glue them in. Here I add CA glue to the back of the endplate. This leaves the front relatively clean. In the bottom picture we proceed to file both sides. On the top this is to line up any rod that might be slightly out. For the bottom filing may not be needed since these should be hidden in the wing body and the extra length will make the glue joint to the body stronger. Here is the kit wing main element with the three views. Cut out a section of aluminum at least twice as large as half of the rear wing. In our case the main wing is made of two parts. Others may be only one part. (Left)Using the brass tubing chosen before the aluminum is bent over this tubing. Be aware that in this case that the ends of the wing will be slightly thinner than the middle. Your first attempts may not be very good so it is suggested that you make several wing sections and choose from your best ones for your new wing. I was making two sets of wings and ended up with 4-5 wing section for each side. (Right)Here is the initial bent aluminum over the brass rod. (Left)Using the kit part we slightly scribe in the rear edge of the wing onto the aluminum one. (Left)On our wing the rear section curls up. To replicate this I use a larger diameter brass rod. The aluminum wing is gently bent over this. Use a rolling type action to prevent a sharp bend in your wing during forming. Here is where several new wing sections are helpful. (Right)Next we sand both sides of the inside of the wing at the rear (approx. 100 grit). The sanding gives the glue more surface to bond onto. With most of the material cut off we can go in with files to get the correct shape of the wings. From the top view you want to make sure the ends and middle are parallel when things are going to be glued together. If the ends are slightly out the endplates may toe in or out. For the front view if the angle isn't correct the ends of the wing may not be at the same level or the wing endplates may be slightly angled. When you are satisfied that the parts are OK you can proceed to glue the halves together. Fit a smaller brass rod or tubing into the one glued into the wing. A snug fitting tubing/ rod is preferable but not necessary. In the diagram you can see that this rod is bent to fit in the wing. Once you are happy with the shape of the inner tubing/ rod you can glue the assembly together with 5 minute epoxy. Here is the finished product with kit part on the left and two new wings in the middle and right. On the wing I did, the mounting post is aerofoil shaped. There is aluminum tubing from a hobby store that is similarly shaped. I matched up the kit part to a tubing with a similar shape that was modified. Brass pins were glued into this tubing and holes drilled into the wing to mount it. The brass structure for mounting the wing to the car was soldered together and glued into the aluminum mount. As an added bonus the mounting point to the car is made of tubing. I can use 00-90 nuts and bolts to mount and take off the wing from my model. Hopefully I have explained this clearly. If there is anything you don't understand just e-mail me and I will try and help.
. This page constructed with Netscape 2.0. Designed with 1024X768 screen but can be viewed with 800X600.